The purpose and theory behind the 72 hour kit is a sound idea. Have at least the bare minimum essential gear, food and water necessary to survive for no less than 72 hours per person in a bag that’s easy to carry. They are loosely based around the survival rules of three. One can survive three hours without shelter in harsh weather, three days without water, and three weeks without food. In the event of a serious emergency when you are compelled to leave your home quickly, with only minutes to prepare, just grab it, throw it in your vehicle and leave with only a moments notice. In theory this sounds great and many people have bought into it. There are many flaws with this concept and the vast majority of commercially available 72 hour kits. Especially budget priced kits. It’s an idea that sounds great in theory but doesn’t always work in the real world. Let me continue by saying; I don’t believe in 72 hour kits. It is likely that if you purchased a 72 hour kit years ago it’s nearly completely unusable now. Most of the “off the shelf ” kits are junk. If you tried to use some of the components in real world conditions they probably wouldn’t last a day. To put your life in the hands of a cheap kit and stuff you’ve never used is just plain foolish and could possibly cost you more than just the price of the kit. A kit should be comprised of tools and supplies that you use regularly that are made to hold up to everyday use. Only with regular use and practice do you actually learn how to use your gear to survive when it becomes critical. Try this once with a cheap off the shelf 72 hour kit and you won’t be able to use it again. My advice; avoid them. I mean seriously, the tube tent that came in that cheap 72 hour kit would barely hold up to a light breeze or a trickle of a rainstorm. Maybe you alone could make due with it but is it good enough for your family? Secondly, 72 hours isn’t nearly enough in most circumstances. Thirdly (is that at word? ), if you pigeonhole your survival into a 72 longer window there are only three things that you really need. Shelter, clean water and safety. Remember, you can go for up to 3 weeks without food. Some longer and some shorter depending upon our body fat composition. I carry my 72 hour kit around my waist. Some people could last through an entire winter. Most 72 hour kits do very poorly at taking care of the need for shelter as well as water, and most do nothing to address your personal or family safety. They contain items that are meant to provide the average person with at least a little bit of peace of mind. They do the opposite for me. So, if you’re only prepared for an event that last only 72 hour, what happens if no one has come to your rescue after then? What is the status of your supplies and more importantly where is your mindset at that point? Is it really your strategy to put your life in the hands of strangers? Or even worse; the government?! If you’re smart about your emergency preparations you’ll have different layers of preps. Take it upon yourself to ensure that you’ll not only survive a 72 hour emergency but also have the tools and the knowledge to thrive far beyond that. This layering can begin with your supplies at your home, then include your car kits, edc kit, bug out bag, inch bag and bug out location supplies or however you choose. These will be different for most everyone according to their emergency preparedness plans, bug out or shelter in place scenarios and various other factors that each of you will have to determine for yourselves. Here’s what I do. Learn from it, apply what you will and adapt according to your own needs and plans. There is no one-scenario-fits-all plan. I have one bag. This bag is a “72 hour” kit, EDC kit, bug-home bag and even an INCH bag all at the same time. Call it my tool kit, survival kit, or go bag. What it is is a supplement to the EDC items I always carry on me, in my work bag and everything else I carry in my vehicle. My work and everyday situation does not take me far from my rig. Now, if i’m in the back country many of the supplies I’ll carry are oriented to helping me first to get back to my rig. Then the stuff I have in my rig are to help me get back to my home base where my family is, as well as the majority of my supplies. When the SHTF what are your plans? Do you have a bug-out location chosen, staged and prep’d? If so do you plan to get there on foot or by vehicle. Does preparing a 50+ lb bug-out or INCH (I’m never coming home) bag make sense to you and your situation? For me, in our current families situation it does not. Is there a possibility that our family will need to evacuate our home at a moments notice? Sure, but the likelihood of such an event is minuscule. I know this because I have researched and evaluated and practiced and planned and made decisions and preparations about where we live and how we prep. None of these scenarios or plans involve walking a great distance with packs on our back. It’s not realistic or feasible for us in our current familial situation. If relocating from our home is the only option then a 72 hour kit by itself isn’t gonna do us much good. The rig that I drive, that is pictured below, is a key part of our plan. 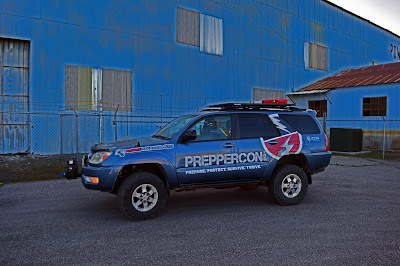 It is very capable in both urban and off road environments and can overcome many obstacles of a disaster or SHTF scenario. It gives us an edge and the best chance of surviving the widest array of potential situations in our area. We also have a trailer that can be loaded up quickly if we need a fast exit for an extended period of time. If you’re gonna bug out this way you might as well go adequately prepared. Go heavy. I always keep the tank full at the end of the day and have additional fuel stored safely. Realistically, how much weight can you carry on your back and how far and long can you carry it? How quickly can you move with it and how agile are you? Can you shoot accurately while moving and taking cover with it on? 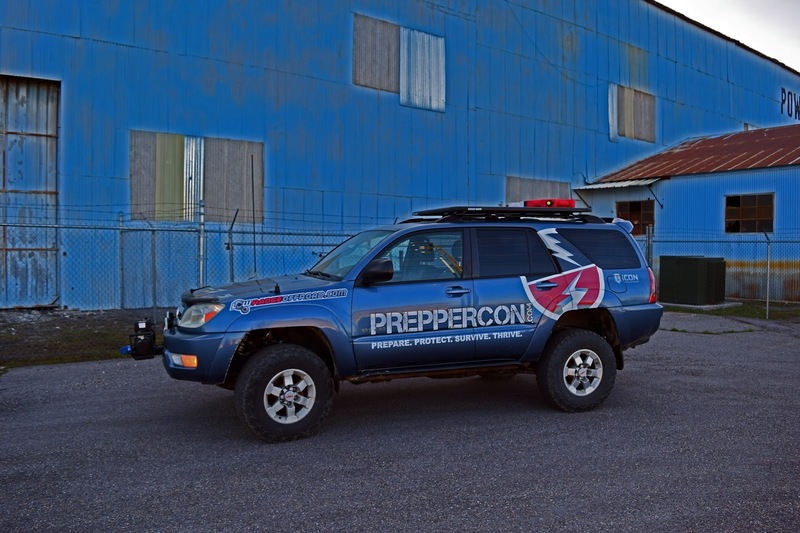 In virtually any SHTF of disaster scenario your personal safety and security will need to be a significant consideration. My first layer is my EDC gear. Stuff I carry on my body at all times. This includes a quality pocket knife, 200+ lumen flashlight, handgun and additional magazine, swiss tool, wallet with cash, watch, cell phone, hat/ball cap, pocket survival kit, the specific kinds of clothes I wear and comfortable but tough shoes. The season dictates what additional layers I wear. Don’t forget the first of the survival rules of three. Shelter does not have to be a tent. It can be the vehicle you’re driving or a quality jacket and wearing the appropriate clothing. My second layer is my business bag. The bag I carry for my work. Most of the bag is used to carry more EDC stuff and not just work files. Call it my man purse if you want. I don’t care. In it I carry a larger folding knife, collapsible baton, tourniquet, first aid kit, meds and essential oils, spare eyeglasses, lighter, signal mirror, spare flashlights and batteries, N95 masks, hand sanitizer wipes, tissues, Mylar blanket and other stuff that comes in handy everyday including snacks and candy. My third layer is my vehicle. There is no reason you should have an empty trunk! The items I always carry include; a large first aid kit, a vehicle tool kit including jumper cables and other supplies, tire repair kit, folding solar panel (for charging small electronics or the vehicle battery) inverter, road flares, air compressor/CO2 tank, wool blankets, extra water, extra gas can, winch, recovery straps and shackles, large water filter, HAM and CB radios, and many other items. I carry a water bottle with me in my vehicle that is my primary water source each day. Remember, after shelter, water is the next most important consideration. My fourth layer is my go bag. The one pictured above. It’s an all purpose, multi-purpose bag. It holds my most essential and most valuable gear for when I am confronted with difficult situations. It is NOT a 72 hour kit. It’s contents compliment my knowledge and skills and as well as the other EDC items I carry daily. It is meant to be effective for an extended duration. When it come to selecting it’s contents quality is the name of this game. It doesn’t make sense to go cheap on anything that I depend upon. This goes for the Toyota 4Runner that I drive, all of the work I’ve done to it, including the ICON Vehicle Dynamics suspension system, the Warn winch and lightweight Trail Gear synthetic rope, the Rhino Rack and RotoPax tanks mounted on the roof. Every single piece of gear I use and include in my go bag and all of my EDC gear I have carefully selected over years of trial and error. “Sawyer mini” water filter and water pouches. Fire starting kit – ferro rod, lighters, matches, tinder, etc. Add other items as you see fit or have the personal need. I go through this kit every week. I add and I take away. I replace what has been used. If I have found a better option or better way of doing something then I make a change. The most important part about this bag is the bag itself. Supplies will get used up and worn out and you’ll replace some of these components. But a quality bag is the foundation upon which the kit is built. 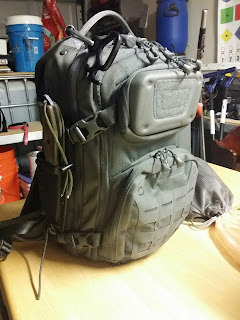 That is why I chose the Maxpedition Riftcore for this particular use. Don’t forget, the purpose of this kit is to augment all of my other layers but it also stands well on it’s own. My fifth layer is our home base. This includes all of our food and water storage and other supplies including the food and supplies in our cupboards we eat and use everyday. It also includes our small garden out back. This layer also includes the community around us, our neighbors and other resources in the town we live. Another kit I consider part of this same layer is our cook kit. It is a rugged container that is on a shelf in our garage. It contains a camping stove, fuel, utensils, cooking supplies and enough freeze dried meals for the entire family for a week. When we go camping this tote usually goes with us. If we need to jump in the vehicles and leave quickly it is at our fingertips. The food in this kit is freeze dried meals, like Mountain house meals sealed in foil pouches. They can be expensive but they taste great and have a shelf life from 3 to 7 years or possibly more. I make sure to include feel good foods like hot chocolate and freeze dried fruits. The sixth and final layer is our bug out location. For us this layer is not yet fully in place although steps are being taken and plans made. The reasons to bug-out are many but it is not always the right decision and is almost entirely dependent upon where you currently live. Regardless, where ever you decide to go you either have to take all of your supplies with you or have more already in place. If you’re taking everything with you then you must consider how you’ll get there and when is the right time to leave. For us, the medium to long term plan is to make this bug-out location our permanent home so that we won’t get caught in the chaos of bugging out after a disaster. Getting out early is the key. The use and need for an actual 72 hour kit for most people is minimal. Sorry, it’s just not that easy. Having these different layers in place all the time will give you far more autonomy than 72 hours. Consider your circumstances and evaluate the possibilities. IF you truly have a situation that requires a bag that you can grab on your way out the door, that can hold everything you will need for only 72 hours just to survive, then build one yourself. If you only have yourself to be accountable for then that makes survival much easier. However, when your entire family counts on you then you had better do it right. Carefully consider your needs, do your research and then practice. Have all of your other layers ready and ensure sure they are ready all the time. This really isn’t a huge task. It’s called everyday preparedness and it has become a part of my lifestyle. Do you have any other thoughts or comments? Please feel free to share.